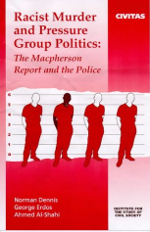 The Macpherson Report (1999) produced no evidence at all of racist policies in the Metropolitan Police. The report did not even produce evidence of any racist “bad apples” among the officers who were involved in the investigation into the murder of Stephen Lawrence. See also the accompanying Institutional Racism and the Police.